Supercharge promotion of your 506(c) offering through one investor portal. Maximize the advantages of a 506(c) based “public offering” by using a custom web portal to promote your offering and engage investors effectively. Modern capital formation is inherently becoming more high tech and certainly more focused on web-based applications to capitalize a business or project effectively. 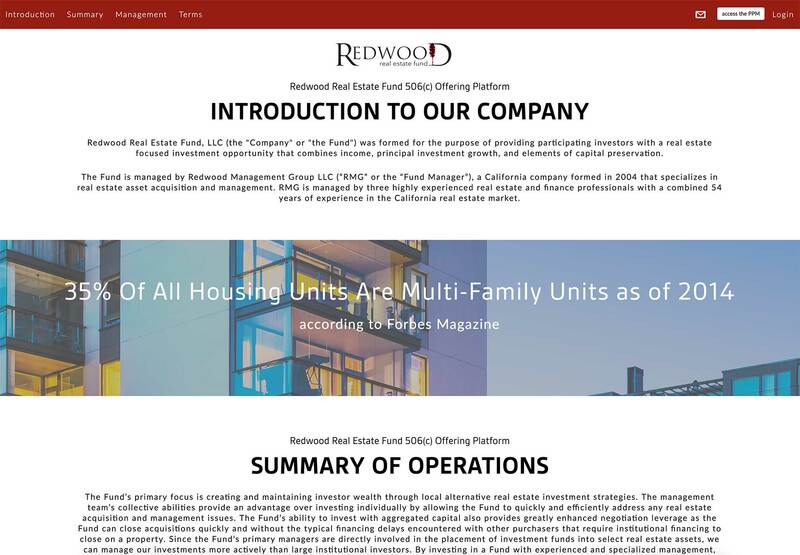 Using a dedicated front-end website to engage investors provides significant advantages over a simple link or summary page on a corporate website. A dedicated front-end, married to a compliance portal, ensures that prospects are provided critical information about the company, opportunity, and the offering effectively and efficiently thus converting more prospects into potential investors. Still using term sheets and pitch decks? Why not send investors to a custom offering specific website that provides a more comprehensive interaction then a simple powerpoint presentation and provides the capability for an interested investor to request access to all critical offering documents and data necessary to consummate an investment decision? Supercharge the execution of your offering by using an RDR Investor Portal and start engaging investors more effectively. Learn more about the features of our Investor Portals by clicking on the features you are interested in from the graphic. We offer several variations of our “one page” template which is customizable to your offering. If these options do not fit your needs please contact us to inquire about a custom designed portal for your offering. Build Fee: $3,500 per portal for RDR Offering Preparation clients ($2,000 deposit is due upon engaging services); $5,000 per portal for Non-RDR Offering Preparation clients ($3,500 deposit is due upon engaging services) with the balance due either (a) immediately upon RDR and Client deeming the Portal development final and prior to RDR upload of website files to the server for launch of the Portal or; (b) 60 days net from engaging RDR for Portal Development Services whichever comes first. Monthly Access Fee: $30 per month access fee (six month minimum commitment). The monthly access fee covers hosting and server-side software required to run the portal. Annual Renewal Fee: $150.00 annual renewal fee. 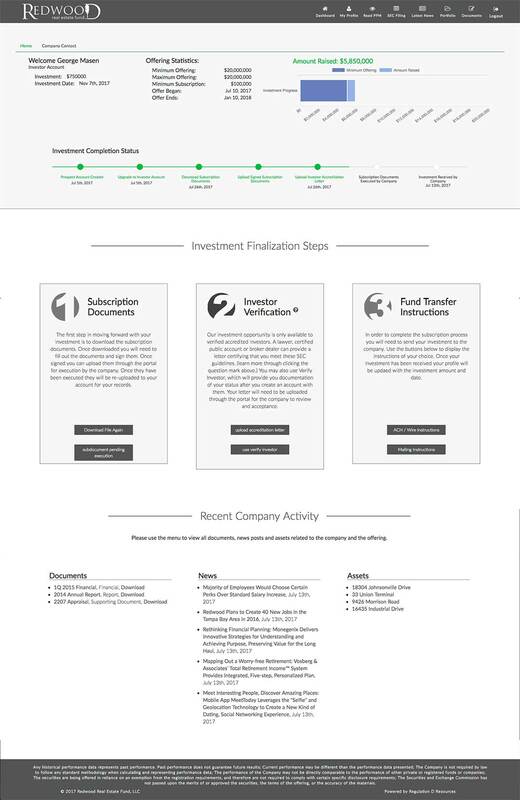 The RDR Investor Portal website provides for all investor vetting, subscription, and compliance processes related to investment in a private securities offering. 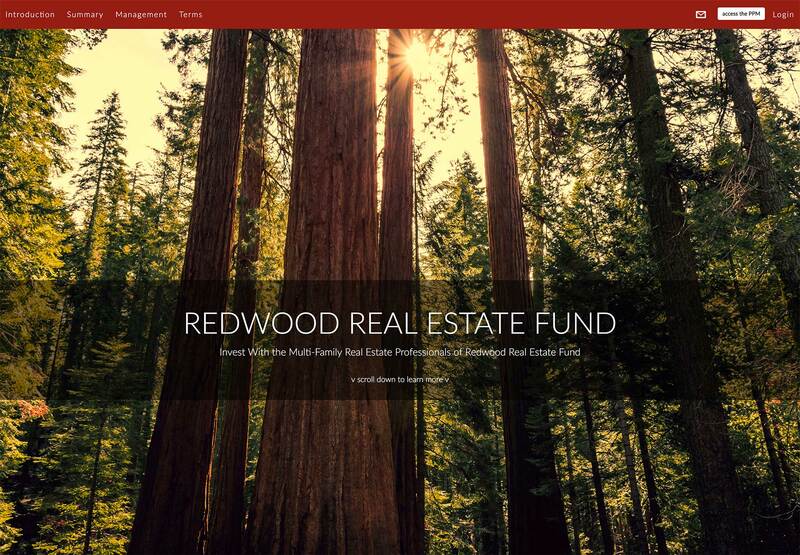 The RDR Investor Portal has a prospect level of access and an Investor level of access. Features and process descriptions are below. The Administrator can approve or deny Investor Prospect access or may contact the prospect prior to approval. Investor Prospect level accounts are limited to viewing the PPM documentation, viewing Offering Statistics and accessing SEC filing information. User selected PPM Delivery options include a downloadable Adobe PDF file, online Flipbook viewing, or ordering delivery of printed materials. Call-to-action buttons allows an Investor Prospect to easily apply for an Investor level account using the “Invest” feature. Once an Investor level account is approved – the portal will now notify the Investor they can proceed through the investment subscription process online. 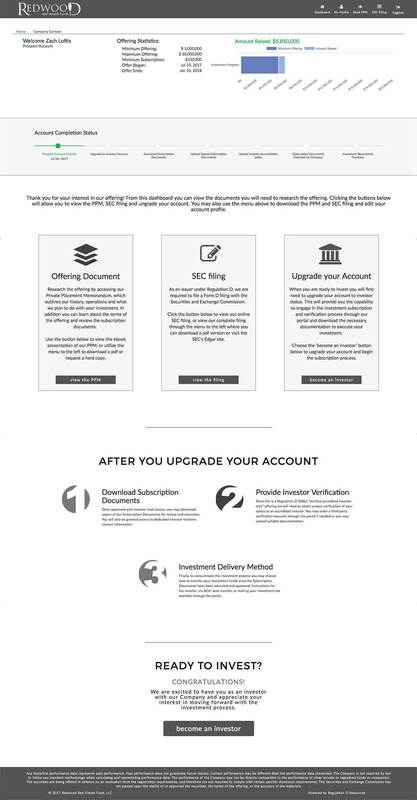 Investors are then provided; (a) investment transfer instructions and the options for transferring funds; (b) delivery of the subscription documents for execution and upload back into the Investor’s account and; (c) the upload or ordering directly through the portal of an accredited investor verification (required in a 506(c) based offering). Clear modern user interface provides for efficient processing of Investor’s – even those that are not “tech savvy”. The portal tracks and time-stamps every step in the subscription process and provides Client Administrators with status updates and reminders for tasks such as approving and upgrading user accounts, counter-executing subscription documents, and reviewing verifications. 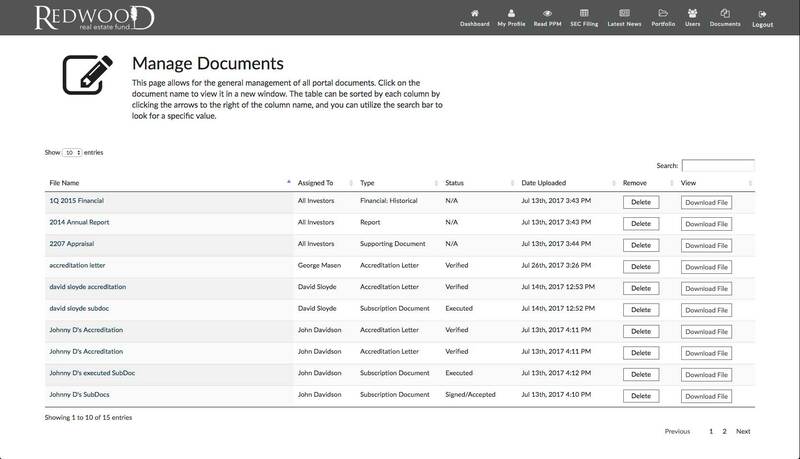 Administrators can easily track needed tasks and actionable items on all accounts from the main Administrator dashboard. Once an Investor Account is complete – the Investor now has access to the portal’s Investor Relations application and can manage their profile and view all uploaded documentation. 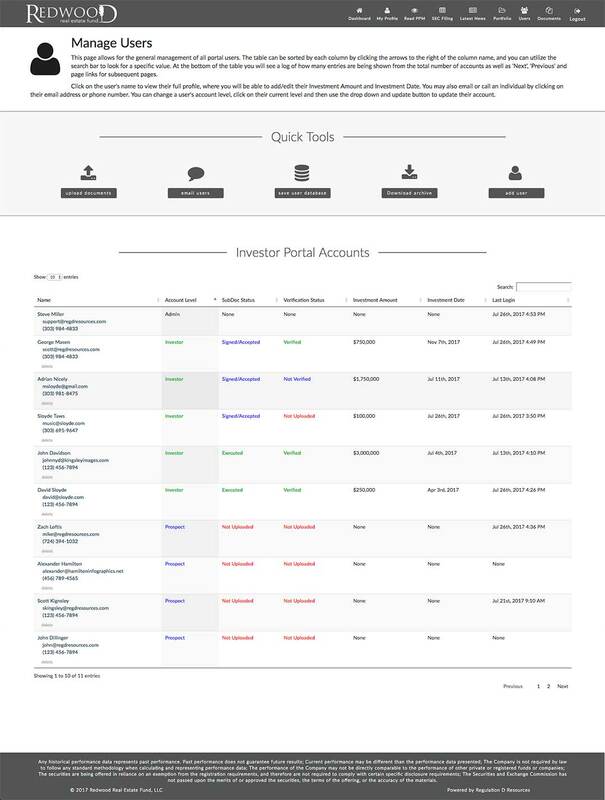 The admin interface of the RDR Investor Portal website was specifically developed to make management of all tasks related to the execution of the offering more efficient and effective. 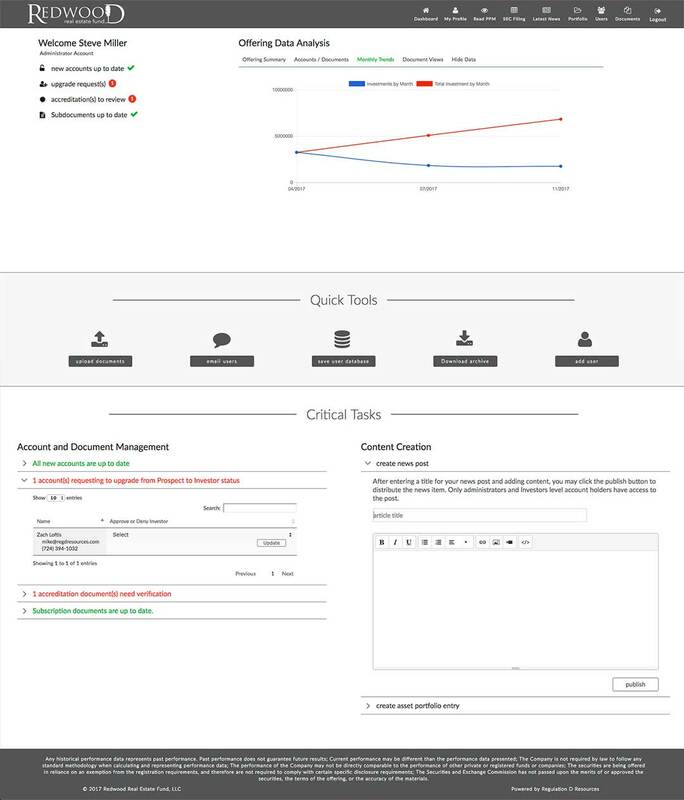 Front and center in the admin interface is a task manager application that provides the admin with information on any actionable tasks that need to be attended to related to the offering including approving prospect accounts, approving investor level account access, counter-executing subscription documents, and reviewing accredited investor verifications. This task manager allows the admin to efficiently manage key processes and tasks related to the offering. Pending actions section at the top of the Administrator Dashboard provides status of all key actionable items such as account approvals, account upgrades, counter-execution of documents, and review of verifications. 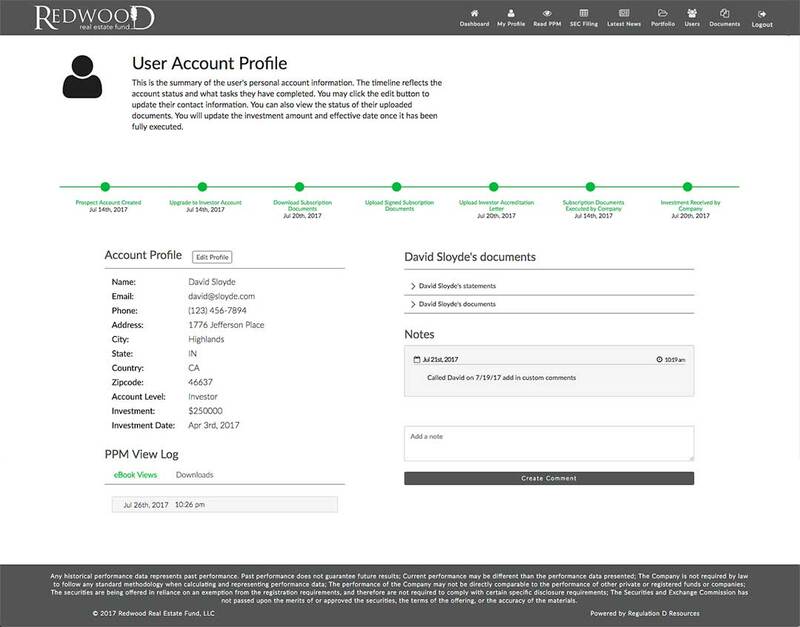 User management system that allows instant access to all accounts and review of uploaded documents, date and time stamps, and user information. 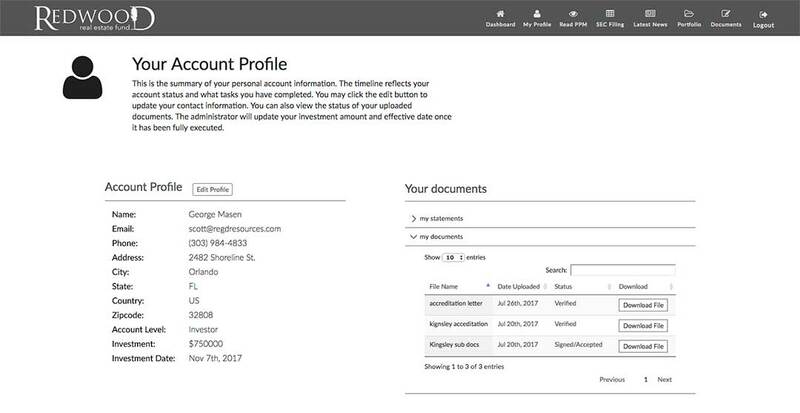 Easily upload account statements and K-1’s to individual accounts. The portal will automatically notify the Investors of new documents, reports, financials and news posts updated in the portal as well as any documents uploaded to their account. Time and date stamped tracking of all prospect and investor actions, and housing of all subscription documents and accredited investor verifications in the portal, provides for a seamless and efficient tool to handle any SEC or State level compliance audit. Managing investors once they have invested into your company is a primary and key responsibility for company managers. 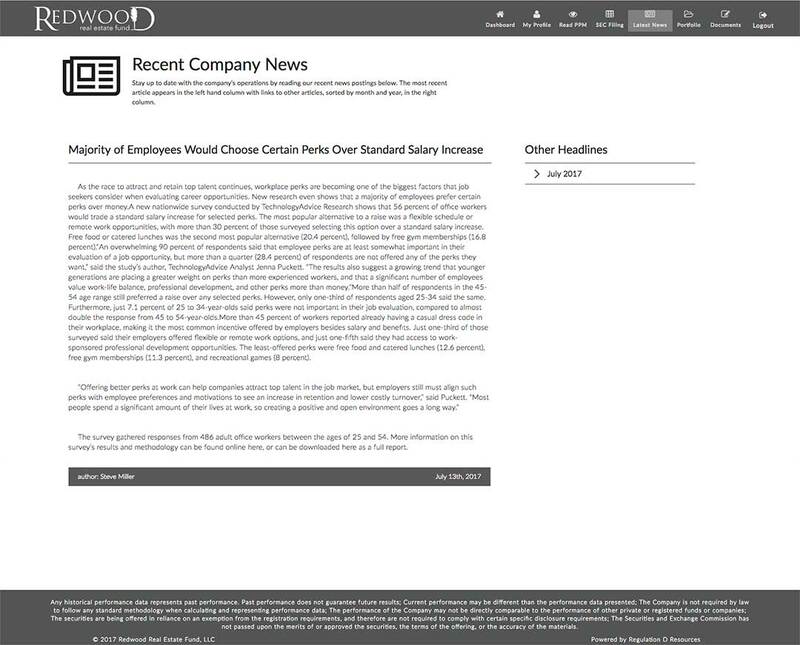 The RDR Investor Portal Website includes an Investor relations application that provides your investors with access to company updates, quarterly and annual reports, and financials. 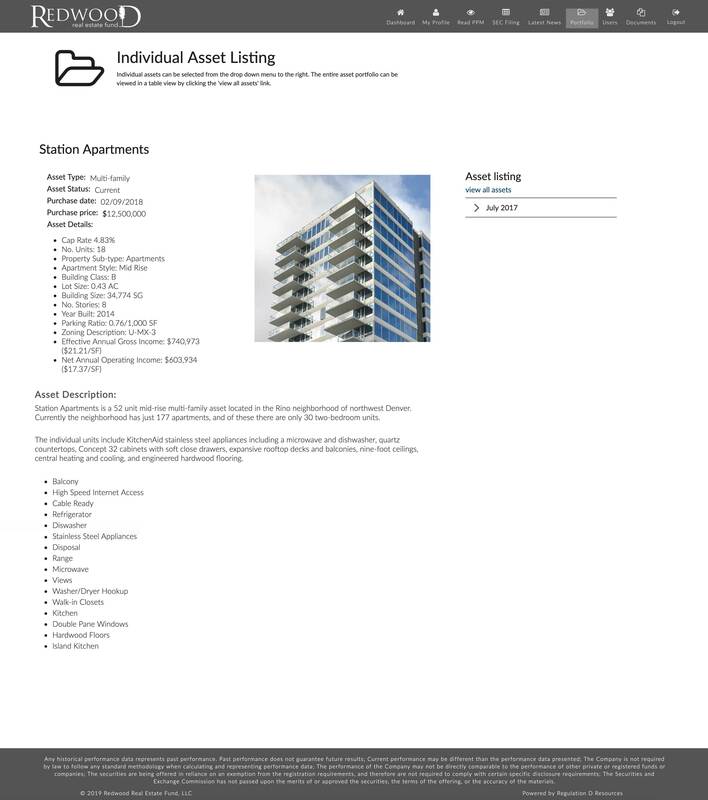 We also have a portfolio application that allows investors to view an asset portfolio in real time. Real estate funds, for example, can list the portfolio of properties in the portfolio application along with pictures of the assets, property data, current value, acquisition and disposition data, lease revenue, and other pertinent information. We can customize this application for other industries such as oil and gas to provide the same functions for other asset classes. The investor relations application also allows the administrator to upload and deliver K-1’s and Investor Statements directly to investors through the portal.